"A tripod of very tall thin saplings is painted with happy scenes of cows and family dinners, but each peeled sapling has a red drippy line that draws the eye inexorably upward to a hanging basket made of bone and other animal remains. Robinson calls this her "farewell to the carnivorous lifestyle" but what's nice is that it doesn't feel sinful or heavy-- it's a cheerful and loving offering that releases the artist's past without getting preachy." It LOOKS jolly, but among the pictures of cows and people eating meat were portraits of the victims of Mad Cow Disease, so even if it wasn't preachy, it expressed anxiety. 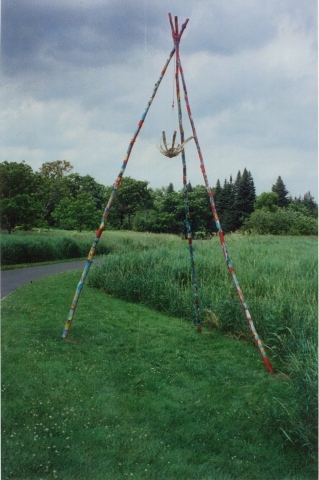 This work was displayed in Stowe, Vermont for the Exposed Sculpture Exhibit from July through October. Over the course of the summer, picnickers tossed beer cans into the bone basket .